I remember when I got my first computer, ever, at the age of 24. It was a Macintosh Performa 638CD, and it came with this sweet little 14.4 baud modem that was my entree to the whole of the internet, which really wasn’t that popular back then. I remember finding this cool little icon on the Mac with a little hand-drawn person on it, called eWorld. Hmm, I wondered. What the heck was eWorld? 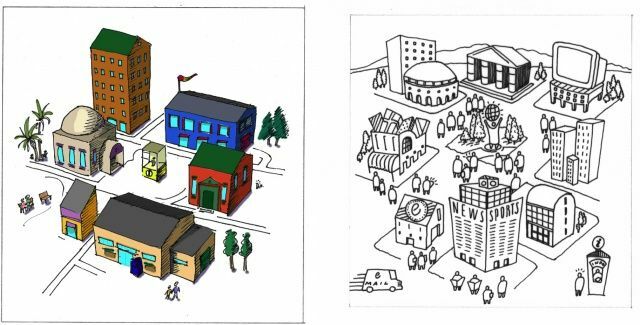 Clicking through, I found an adorable little electronic village, all in that hand-drawn, gentle style. Oh, this must be like Compuserve, or Prodigy, right? Well, yes and no. The softer, gentler world of eWorld was only for Macs, and it was my favorite place to go. Never mind that it was kind of empty; it was beautiful and I loved it. In 1985, Apple had an industry network, called AppleLink, for employee, dealer, and eventually developer support. It was run by GE’s online service, and Apple was paying GE to run the backend, while Apple managed the actual services. At its peak, AppleLink had had 50,000 registered users, 38,000 of which were external to Apple. Looking to phase this out, mostly to save money, Apple wanted to purchase or build its own online service. Soon after, Apple created AppleLink Personal Edition, a similar tech-support system for consumers, with Quantum Computer Services running the backend. Quantum Computer Services soon became America Online, or AOL, with a young Steve Case at the helm. 1987 saw Quantum running AppleLink PE, with Apple getting a percentage of the fees Quantum was charging users of the service. When Quantum’s contract was terminated by Apple and Apple cancelled the GE contract in the early 1990s, it was time for the Cupertino company to build its own online service to compete with AOL, which used the termination fees from the contract termination to fund its start up. So, Apple struck a deal with…AOL, who would run the new online service and license AppleLink PE back to Apple. 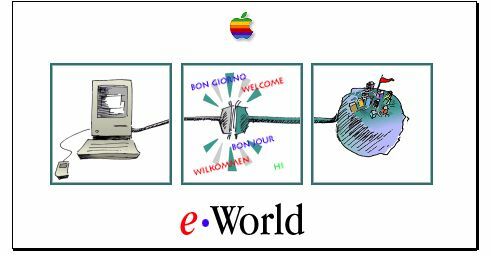 It was 1993 when the new Online Services group, including the group manager for Research & Development, Scott Converse, started to work on what would become eWorld, a Mac-only online service to compete with Compuserve, Prodigy, and of course AOL. Another group, led by Lance Cowell, was also instrumental in developing the online service. “What we didn’t know is that AOL had already prepared it’s bankruptcy papers – this deal ultimately saved them. Steve Case had a great poker face,” said Peter Friedman, then vice president and general manager of Apple Online Services, now CEO of LiveWorld. The visual look and feel of the eWorld user interface began life in Converse’s office, as he sat planning with another creative type, Cleo Huggins. He had a habit of capitalizing words in the middle, programmer-style, so when it was time to come up with a code name for this new project, this electronic world, she wrote it on the whiteboard: eWorld. It was collegial teasing, but after all was said and done, it was Huggins’ project name that won the day. Trevor Griffiths worked as a programmer for eWorld, having been a key team member for AppleLink and AppleLink PE. He designed a coding language (based on a concept by a coder at Quantum Computing/AOL) that separated the data stream from the graphical presentation of that data, paving the way for the ability to change the way eWorld looked depending on the season or the function of each graphic. “I remember flying out to Vienna, WA, holing up in their headquarters there, and arguing about functions, features, coding, etc. I was overseeing the design of eWorld – working with AOL,” he recalled. When eWorld went online, however, the combination of real time chat and a distinct graphical style really made it stand out.